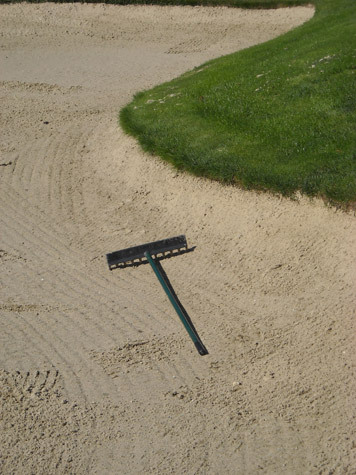 Where and how to Position a Rake: In or out of the Golf Bunker? Here’s a good question for all you lovers of the Rules of Golf and it is one that certainly had me stumped for a while; where and how do you position a rake at a bunker once you have finished playing your shot from the sand and have prepared the bunker for the next group? My good friend Tommy Priest told me of a time when he was playing a shot into a green and slightly mishit it, the ball rolled to the side of the green, clattered into the prongs of a rake that had been left at the side of the bunker, deflecting the ball which rolled down, onto the green and into the hole. A freak occurrence this may be, but it does raise the issue of where do you store the rake when you have finished using it. As such, many golf courses may have their own rules about where a rake should be placed when not being used, so it may be wise to find this out before playing, especially on a new course. However, at times there may not be a policy, or you may be unable to ascertain whether a course has such a policy or not before you start a round. In these situations, what are the best guides to follow? Of course, this is of little consolation to a player who hits a slightly errant approach and watches his ball clatter into the rake and disappear into the woods, or down into a deep bunker. However, the alternative would be for a ball to land in a bunker and come to rest, perhaps on a slope, against the rake. As such, this makes the bunker shot markedly more difficult for the player as the player has to proceed under Rule 24-1, which could see them forced to incur a penalty shot as any dropped ball could roll closer to the hole, forcing them to drop outside the bunker and incur a penalty stroke. 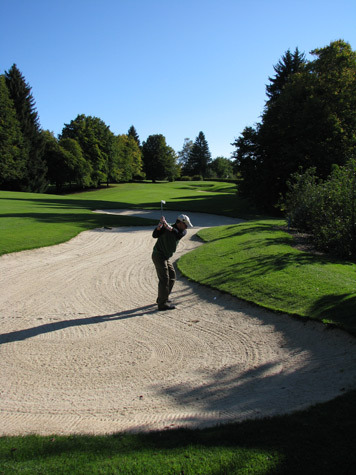 In addition to this guidance, the Golf Course Superintendents Association of America recommends that rakes are placed outside the bunker, laying with the tines upwards, parallel to the direction of play on the hole. This seems sensible, until you witness the first golfer absent-mindedly stand on the tines, sending the handle of the rake crashing into their face, or somebody accidentally runs over the tines with the wheel of their golf cart. Some golf courses have come up with creative ways to address the rake issue. One course sunk tubes into the ground outside bunkers so that rakes could be dropped down the tube with the tines of the rake lying flat against the turf. This sounds a good idea, but requires a huge number of very narrow and surprisingly deep holes to be drilled on any course wishing to follow this example. Of course, one simple solution is to place rakes on golf carts, so there are no rakes out on the course. While practical for social or amateur play, it is a problem at a professional level where carts are not allowed and thus caddies would have to cart not only a players bag, but also a long and unwieldy rake with them around the course. The issue of rakes is good example of a seemingly simple problem not having a perfect solution. 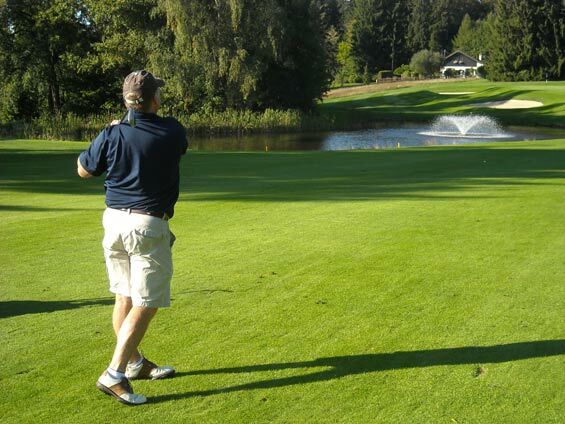 Yes, even if you follow the guidance offered by the USGA and Golf Course Superintendents Association of America, there is still the chance an errant tee or approach shot can hit a rake and be propelled into the woods, a bunker, a pond or, if fortune smiles, onto the green and even into the hole. But my feeling on the matter is this; that is all part of what makes golf a great game, why do we need to change anything? Golf would be a pretty dull game if every round we were not subject to the vagaries of chance but simply played to our level of ability that day. Part of the beauty and attraction of the game is that things do not always go to plan. It allows us to be creative, dream up wacky and improbable shots, it is a part and parcel of the game which should never be eradicated because it does not need to be. 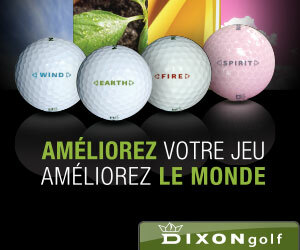 Part of the attraction of golf is that it has no rhyme or reason. Tommy’s mishit approach should never have ended up in the hole, but it did. In the same way that someone else who hits a beautiful shot directly at the hole, sees their ball clatter into the flagpole and be deflected into a bunker. So the issue with rakes is an interesting one. We can follow the guidelines to make the game as fair as possible for sure. But I thank goodness that sometimes, golf isn’t fair. One of the worst shots I have ever hit ended up being a mishit Eagle bump ‘n run chip in from around 80 yards. It is still the best shot I’ve ever played. So remember, tines up, rakes parallel with the direction of the course outside the bunker, unless your committee or course has its own rulings on the matter. However, just don’t try to follow Tommy’s example of using the rake to help deflect the ball into the hole. That way lies madness! Tips on How to Choose a Good Golf Shoe? 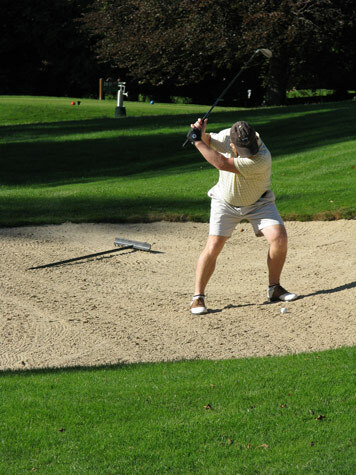 Are you allowed to carry the rake into the bunker and place it down prior to hitting your ball?